The 7 of Wands is the card of fights. Someone will make hassle for you, possibly to the point that they will become a serious problem. Arguments are always foretold with the 7 of Wands. You will not see eye to eye with someone. This individual could be someone you care about such as a lover, friend or family member. It could be a rebellious teen is stirring something your household. The trouble make will not respect you or appreciate your way of doing things. At work and business a jealous competitor will go out of their way to affect your reputation. The competitor will want what you have and will be willing to challenge your authority publically or behind closed doors. This person is out to steal your crown. Alternatively, you may not really know the trouble maker at all. The individual you’re about to have problems with may not be in your life yet. It could even be someone on the internet who is watching and judging you from a distance, waiting for the right time to call you out. The 7 of Wands in an outcome or future position predicts the moment which a conflict will come to a head (it is not the type of situation to slip under the surface). You should, therefore, be prepared to ride into battle some time soon. As a positive, the 7 of Wands means that you have the advantage long-term. This troubling person covets what you have, but you only have that thing because of your hard work, personality and character. Your competitor does not have your traits. Therefore, although you will fight to remain on top; chances are you will stay there for at least a little while longer. On a lighter note, historically, the 7 of Wands was a card of financial gain and profit. Therefore, if you blend the ancient and modern 7 of Wands meanings, it is not a stretch to say that your competitor is just jealous of your success. In a romantic capacity, the 7 of Wands is not a great card to receive. The 7 of Wands predict that you will always be engrossed in arguments with your partner. If the 7 of Wands appears in a future or outcome position of a love reading, then this means that your relationship will end due to constant bickering, jealousy and conflict. If you’re wondering what a lover or potential lover’s feelings are towards you, the 7 of Wands means that they see you nothing more than a bringer of trouble. This could be something that you have no control over; they could see your entire gender group as aggressive due to mommy/daddy issues. In my Love Tarot Meanings e-book, I have meanings which dissect your lover's intentions so be sure to check that out. In a business context, the 7 of Wands clearly represents a competitor. While there is some friendly rivalry going on in the 5 of Wands, by the time you get to the 7 things have taken a more sinister turn. This person wants to knock you off of your pedestal and harm your business. There is no question, that you will need to remain strong. Your competition will resort to playing dirty. However, you are advised to rise above it and ignore their behavior. 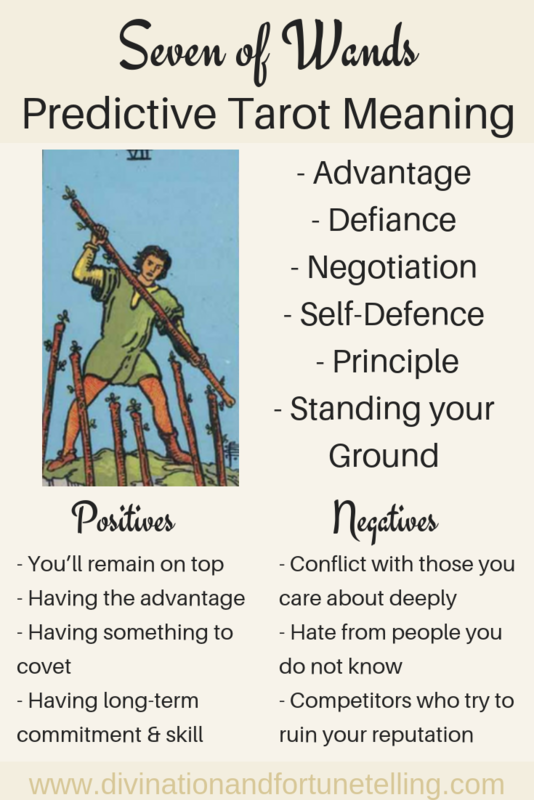 If you find yourself spending more time watching your rivals, anticipating what they will do next than you do focusing on your own business, the 7 of Wands is highlighting this issue to you. Do you and don’t worry about the haters. Sometimes, the 7 of Wands can be more positive as it can symbolize negotiations. Therefore, you will be in a position to ask for more money than usual for a project (a good sign that you’re in demand). Alternatively, you may be the one who is seeking a discount from a supplier: if this is the case, you have a good chance of getting it if you receive the 7 of Wands in your Tarot card reading. The 7 of Wands is usually a no Tarot card.